Thermalign is the sole distributer of GTI Predictive suite of products in Australia. GTI Predictive have developed iPad based predictive maintenance apps which go to the heart of condition monitoring in an easy to master package, at an affordable price. Thermalign personnel are also sessional trainers for a number of companies with courses from bearing maintenance to thermography. 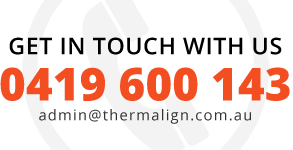 With a long history in training and mentoring of technical personnel, Thermalign has a wealth of experience in delivering training and mentoring by utilising effective communication techniques across all levels.